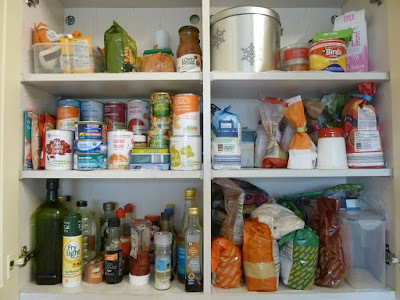 I started June determined to eat up the contents of my cupboards, fridge and freezer, and so began the (drum roll please): STORE CUPBOARD CHALLENGE! I went through my packed kitchen, did a stock check, made a list of potential meals and did a supermarket shop focused on fresh food (all here). I’ve put a list of the meals we actually ate at the end of this post. Normally I try to be economical with feeding the family, but usually I’m lucky enough that I don’t have to keep track of the cost of every meal, and can just buy more when things run out. 1) The store cupboard challenge has definitely helped me make the most of leftovers and become more creative with the ingredients available, rather than eating the same lunch most days. No wonder the food in the cupboards, fridge and freezer builds up, as I focus on eating fresh stuff before it goes off! So far, we haven’t eaten as much of the original top up shopping as I expected. 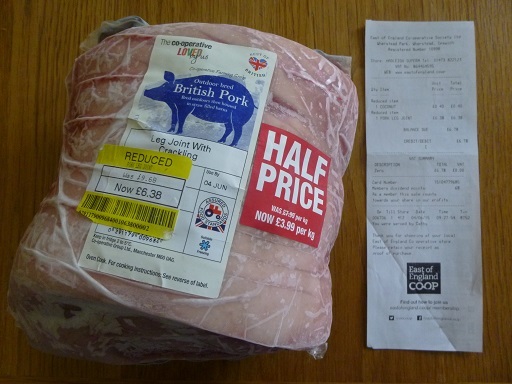 I bought food for just over £50 for our family of four (although it cost me £6 less with the Morrisons voucher), and we only actually ate a third of it, £16.50. A tenner’s worth of food went completely untouched. It will definitely get used, it’s more that with better meal planning I could have delayed those purchases. I’d love to know the cost of the food eaten that was already in the house, to put the shopping in context, but working it out and digging through elderly receipts is taking longer than I’d hoped! It was harder than I expected to go cold turkey and stop shopping for food. 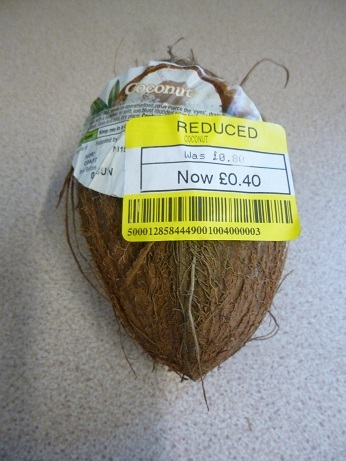 On Day 4 I slipped off the wagon and bought a couple of reduced items in the Co-op (absolute bargain 2.5kg leg of pork with crackling at £6.38, and a 40p coconut just for fun), then realised if I wanted to stop shopping, then surprise, surprise, I had to stop going into shops. 5) After buying more fresh food in a single order than normal, I was worriedabout food waste. In practice I’ve had to throw a few things away, but they all pre-dated the shopping (lonely mouldy crumpet, end of a jar of raspberry jam that had fermented, remains of a packet of fresh coriander, couple of unused egg yolks, bit of chicken stock). Not ideal but I reckon the wasted food cost less than a pound. Will wait and see how that continues. I still have a long list of meals to work our way through, and we’re finally starting to make more of a dent on the cupboards, but I do need some top up fruit, veg and milk. 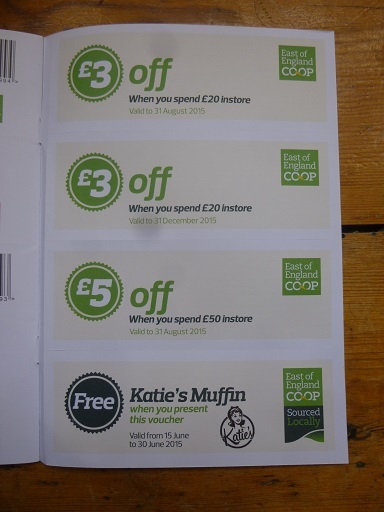 However, with impeccable timing the Co-op have sent some dividend vouchers and money-off coupons, so I’m intending to use those to continue the store cupboard challenge. actually ate, with links to any blog posts with further details. Snacks are listed at the end. Children’s Dinner: Salmon and potato fishcakes with boiled carrot sticks. Mango, strawberry and banana smoothies. Dinner: All invited out for a barbecue! Lunch: Chicken fajitas with peppers, red onion and natural yogurt. Yogurt tubes for the kids, lime jelly for all! My Co-op Divi was just £7 – but every little helps. AND I only got 2 x £3 vouchers too. Hope the divi and vouchers come in handy! 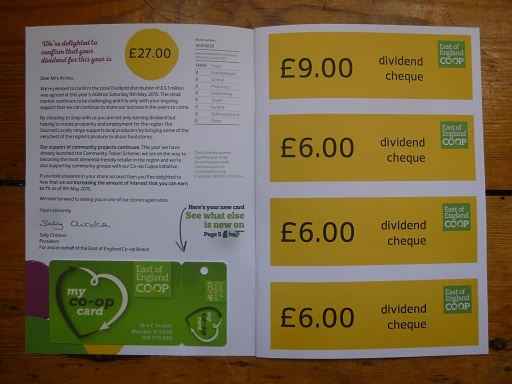 I fear my Co-op dividend will be a lot less next year, as I've been switching to Morrisons with occasional trips to the Aldi in Sudbury. I'd love to support the Co-op more, as I really admire their fairer approach and preference for local food suppliers, but it is distinctly more expensive. 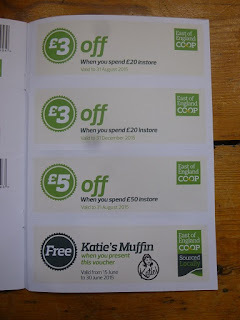 Last summer we shopped at the Co-op a lot but recently I've stuck to top up food and the yellow-stickered sections.